In the last post, I gave you six choices for a verse/chorus song form. Let’s use number 1: the 8 bar verse/8bar chorus. Keep in mind that there are lots of variations; we”l look at some of those later. For now, it’s important to keep it simple. The verse/chorus form (any form really) is a container that we place ideas into. In our case, we’re placing chord progression ideas there. Take a look at our container below. There are 16 bars to fill up. Before we do that though. we need to talk about some of the things you might be wondering about. First, those letters in boxes. “A” is the verse, and “B” is the chorus. Why not just go with “verse” and “chorus”? It’s a good question. For this example, the letters aren’t really necessary, but you’ll find them useful for describing other types of forms. For instance, the standard AABA form. Aside from that, letters allow you to think more abstractly than “verse” and “chorus.” Verse and chorus are distinct things that go in particular places. “A” and “B” are just…letters. We can put them together any way we like. How about ABAABA? You don’t normally see verse and chorus in an ABAABA sequence. And yes, you can put “verse” and “chorus” together in any way you want, too. But certain words can send our brains down well-worn paths without our awareness. For songwriters, verse and chorus are two of those words. Think in letters, and you can create possibilities you may not have thought about. Next, the two vertical lines at the end of the second staff. Those are called double barlines, and they’re used to signal the end of a major section and the beginning of another. The end of the fourth staff has a different type of double barline, one line being thicker than the other. This type of barline is always at the end of a song. Ok. You need a strategy. Is the verse going to have a lot of chords, or just a few? Will there be one chord every bar, or one chord every two bars? 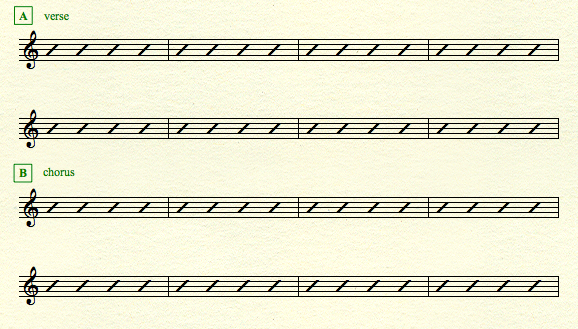 Maybe you want two chords in every bar. Identifying the possibilities like this is the first step. But that’s only one possibility. Another big one is chord quality (meaning major chord or minor chord). Will you use mostly major chords in the verse, or minor chords? Will there be more of one than the other? I’ve only mentioned the verse so far. Define clearly what you want here, because the chorus should contrast it somehow. If you start the verse with a major chord, you might want to start the chorus with a minor chord. If there aren’t many chords in the verse (which means it has a slow harmonic rhythm) you may want the chorus to be busier (fast harmonic rhythm). Keep this in mind as a useful technique. Imagining the different ways you might contrast the verse and chorus increases possibilities. This produces more ideas. The next post is for all you people who aren’t comfortable with the do-whatever-you-want approach to choosing chords. There are actually chord progression patterns that have been used for centuries. I’m going to tell you what they are.